(THREATENED) Timber Rattlesnake - Northern forms range from yellow through brown or gray to black, with dark back and side blotches on front of body and blotches fused to form cross bands on rear of body. Head is unmarked; it has a dark stripe behind eye. The maximum length is about 75". It prefers remote wooded hillsides with rock outcrops, swampy areas and floodplains. Its active April to October; in the daytime in spring and fall, at night during the summer. 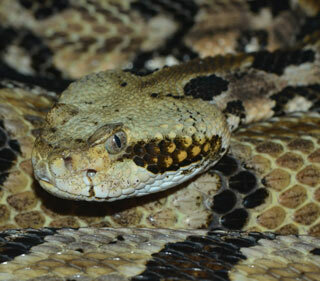 In northern areas, Timber Rattlesnakes congregate in large numbers about rocky den sites and may over winter with rat snakes. Often encountered coiled up waiting for prey - squirrels, mice, chipmunks, small birds; when approached, remains motionless. Record longevity exceeds 30 years.